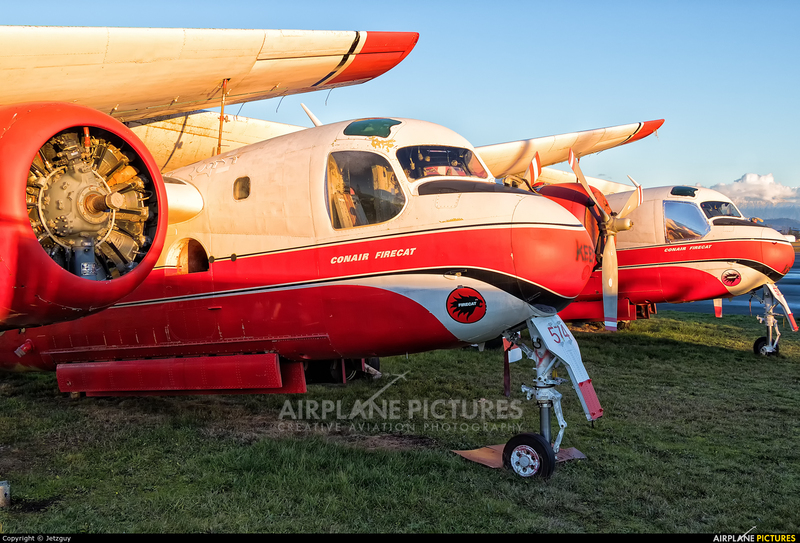 These two retired Grumman Firecats fitted with Wright R-1820 radial piston engines are modified Royal Canadian Navy Grumman Trackers converted for fire fighting. All military equipment was removed and an 870 gallon fire retardant drop tank was installed in the torpedo bay. Some versions were later modified and two Pratt & Whitney Canada PT6A-67AF turboprop engines were added along with larger drop tanks and external fuel tanks. They still serve with the Sécurité Civile in France. CAL FIRE in the USA entered into an agreement with Marsh Aviation of Mesa, Arizona to build S-2T turbine tankers for their fire fighting fleet. 26 were acquired. The S-2T are larger and could carry 1200 gallons of retardant. They are powered by two TPE-331 GR turboprop engines and can fly at speeds in excess of 200 kn (370.4 km/h). This very effective fleet is still the main wildfire initial attack aircraft in California.